The historic town of Palermo is located in southern Italy and is the capital of the region of Sicily and the province of Palermo. Extremely beautiful and attractive for tourists from around the world Palermo has some incredible sights, which includes the Norman Palace. This unique historical complex is located at Piazza Indipendenza, and today is considered one of the most beautiful castles in Italy, with its spectacular Norman architecture. Norman Palace in Palermno is undoubtedly one of the most prominent Arab-Norman buildings in the world. In the distinctive cultural and historical character of Palermo, the Palace of the Normans is an amazing trip back through the centuries. In addition, is the famous Cappella Palatina, which is a chapel of the Norman kings of Sicily, and the opera theatre - Teatro Massimo. The history of the castle can be traced back the ninth century and the time of the Arab Emir and their harems, but most likely Palace of the Normans dates back further. On the site of an old Roman fortress, the Punic Arabs raised their palace. The next milestone in the history of the castle is when the Normans arrived and turned it into a brilliant and beautiful residence. 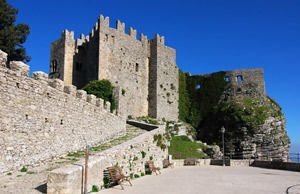 Later in time Normans also leave the region of Sicily today and until mid-16 century Palace of the Normans was in an extremely poor condition. Around 1555 the Spaniards repaired the castle and she again began to shine with all the force of the royal residence. Presently the Palace of the Normans is the seat of the regional government of Sicily. The entrance to the Palace of the Normans from Piazza Indipendenza will take you directly to the brilliant Cappella Palatina. Built by Roger II between 1130 and 1140, Cappella Palatina is a superb and brilliant work of Arab-Norman architecture. Extremely beautiful Byzantine mosaics, which can be seen inside this part of the Norman Palace in Palermo, also date from the 12th century. Only in Istanbul and Ravenna can be seen such details in the style of Byzantine. These mosaics are considered the largest Islamic cycle of paintings, which to this day are well maintained. At the entrance in the Cappella Palatina can see a beautiful royal throne, which also dates from the 12th century, which is another work of art in the Palace of the Normans and shines with its decorations of wild animals, laurel leaves, etc. The magnificent mosaics in the chapel of the Palace of the Normans are unique symbiosis between Islam and Christianity. One of the most interesting paintings is Christ the Pantocrato, which stands on a gold background, where can be seen scenes from the Old and New Testaments. Along with them are depicted as typical symbols of Islam.